We are honored to have been voted Best Summer Camp in 2013 and 2014 by Yellow Scene’s Best of the West. 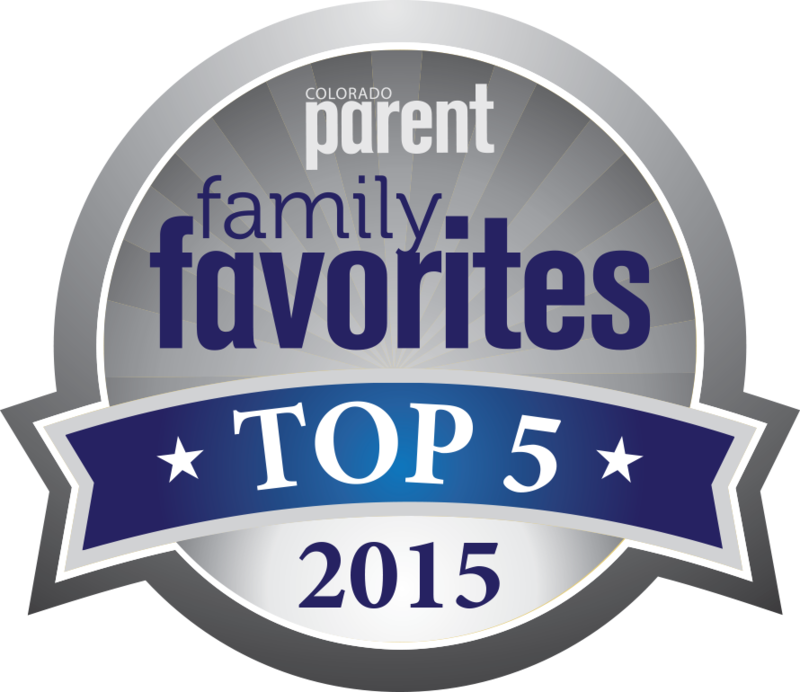 We’re proud to have placed in the top 5 of Colorado Parents’ Family Favorites in 2015. 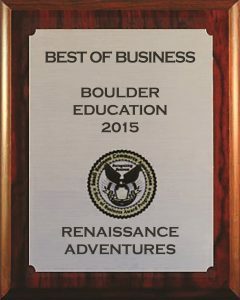 We were very happy to receive the Best of Business Award for Boulder Education in 2015. The Staff at Renaissance Adventures share surprising stories and inspiring creativity in a fresh and playful atmosphere that encourages children’s inquisitive mind and natural intelligence. Renaissance Adventures is a wonderful unique experience. As a teacher I really appreciate all that the children learn while having so much fun. As a parent I love the staff and how caring and concerned they are for the children. We were beyond thrilled with our experience with Renaissance Adventures! The staff worked closely with us to tailor their many offerings to our unique‎ group of children, and proved to be impressively adept at shifting gears throughout each session, in response to our group’s many needs. The parents and children found their events to be a breath of fresh air… outrageously fun, as well as mentally and physically stimulating (while also very safe, which was of paramount importance to us). If you’re considering something very special for your next event, look no further. Treat yourself with Renaissance Adventures! This is a gem of a company with a heart of gold and a passion for delivering quality programs that are unlike any other. We at Horizons have been greatly impressed with the programs offered by Renaissance Adventures. Their talent to inspire creative imaginative play blended with their ability to physically interact with our students in a fun, safe and nurturing manner has made the classes very popular with the students in our school. I highly recommend their program and have found the staff to be very positive role models for our students. My 11yo son and his friends had a blast with Renaissance Adventure birthday party! Thank you so much! My son had the most wonderful time at his birthday party. Thank you for making it so magical. You could tell by the huge smiles on the children’s faces that everyone had a blast. It was the best birthday party we’ve ever had. My only concern is how to top this next year! MY SON LOVES QUEST & QUILL!!!!!!!!! Writing has not been something that he has enjoyed (seems like we practically need a crow-bar to pry out 5 tiny sentences for his nightly writing homework. Last week, however, he eagerly came home and wrote, 25 lines without any prompting. Seriously off the charts!! You guys are AMAZING!!!!! Thanks. Best. Camp. Ever. Provides a safe, carefree, playful environment and loads of creativity and imagination — which should be the realm of all kids, especially during the summer! The Quest Leaders are fantastic. In my kids’ words, their leader was “amazingly, absolutely, positively, magically awesome!” RA has been their favorite summer camp, hands down, for 4 or 5 years now. Renaissance Adventures has captivated the hearts and minds of Friends’ School students. Mark and his cohorts have fun with the children and create a climate of respect and creativity. They are organized and responsible.